U.S. Sen. Michael Bennet’s reelection campaign has its work cut out for them when it comes to distancing the Democratic candidate from his radical environmentalist friends, especially the one who used to work in Bennet’s Washington office. We are speaking of Zane Kessler who now heads the Thompson Divide Coalition, which has devolved from a mealy-mouthed green group to the lowest common denominator in tried and true eco-activism against the energy industry. “We all use natural gas … this is not about being anti-fracking, or anti-natural gas,” Kessler said. 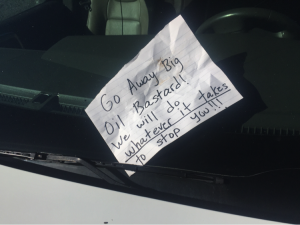 Now his followers have resulted to threats against workers on the Wolf Creek gas field. His coalition openly threatens to create human blockades on roads leading to the development sites or to chain themselves across bridges to stop additional drilling in the very same energy field that provides Aspen with natural gas. But the Obama administration that Bennet loves to support is also to blame. The Forest Service’s wobbly-kneed capitulation last month allowed activists to taunt agency and industry workers during a technical site assessment of a Mesa County natural gas drilling location. The coalition’s metamorphosis from supporters of “business solutions” and “win-win” proposals to radical protestors demonstrates that no matter their stripes, environment groups are all basically cut from the same cloth. Kessler’s group is only an eco-step away from vandalizing equipment and putting the safety of industry personnel at risk, then TDC’s total metamorphosis towards eco-terrorism will be complete.